NVIDIA Introduces The GeForce GTX 1080 Ti! March 1, 2017 — Crowning its award-winning lineup of Pascal architecture-based GPUs, NVIDIA today unveiled its fastest gaming GPU ever — the GeForce GTX 1080 Ti. Packed with extreme gaming horsepower, the GeForce GTX 1080 Ti delivers up to 35 percent more performance than the GTX 1080 and comes with 11GB of next-generation GDDR5X memory, running at a staggering 11Gbps, for the ultimate in memory bandwidth and gaming prowess. 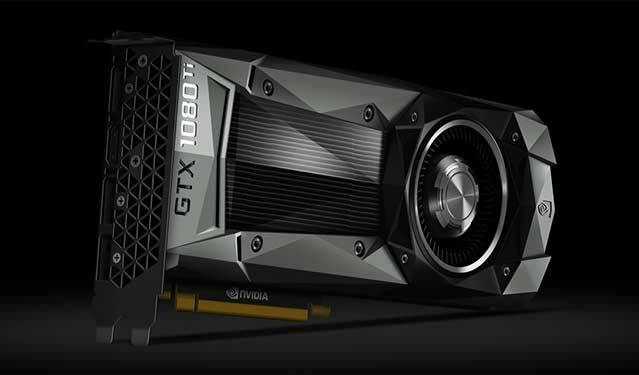 GTX 1080 Ti graphics cards, including the NVIDIA Founders Edition, will be available worldwide from NVIDIA GeForce partners beginning March 10, and starting at US$699.  Massive Features for Massive Performance: The GTX 1080 Ti includes 3,584 NVIDIA CUDA cores and a massive 11GB frame buffer running at an unheard of 11Gbps. It delivers up to 35 percent faster performance than the GeForce GTX 1080 and up to 78 percent faster performance than the GTX 1070. The GTX 1080 Ti is even faster than the NVIDIA TITAN X Pascal, its US$1,200 big brother that was designed for deep learning and artificial intelligence. Next-Gen Memory Architecture: GTX 1080 Ti is the world’s first GPU to feature Micron’s next-gen G5X memory. 11GB of G5X memory running a blazing 11Gbps quad data rate delivers the most effective memory bandwidth of any modern gaming GPU. And it still has plenty of headroom for overclocking. Advanced FinFET Process: The GTX 1080 Ti is manufactured on the industry’s cutting-edge FinFET process. Its 12 billion transistors deliver a dramatic increase in performance and efficiency over previous-generation products. Meticulous Craftsmanship: The GTX 1080 Ti runs as cool as it looks due to superior heat dissipation from a new high-airflow thermal solution with vapor chamber cooling, 2x the airflow area and a power architecture featuring a seven-phase power design with 14 high-efficiency dual FETs. Support for Advanced Graphics Technologies: 4K, VR, NVIDIA G-SYNC HDR and NVIDIA GameWorks offer interactive, cinematic experiences accompanied by incredibly smooth gameplay. GeForce GTX 1080 Ti-based graphics cards, including the NVIDIA Founders Edition, will be available worldwide — across 238 countries and territories — from the NVIDIA GeForce Partner Network, including ASUS, Colorful, EVGA, Gainward, Galaxy, Gigabyte, Innovision 3D, MSI, Palit, PNY and Zotac, starting March 10. Pre-orders on nvidia.com will go live on March 2 at 8 a.m. PT.